Centra is a charming gated community of attached townhouses located in central Boca Raton, FL. Constructed in 2011 & 2012 by The Stiles Corporation and Label & Co., Centra is one of the newer townhome communities in the area. In addition to a wide selection of luxurious, yet reasonably affordable townhomes for sale, the Centra community offers a host of desirable on-site amenities and a convenient location close to all that Boca Raton has to offer. Centra townhomes feature stylish, sophisticated design, as well as many upscale features that are highly-desirable to even the most discerning of homebuyers. Townhouses for sale in Centra often feature beautiful, chef-inspired kitchens with stainless steel appliances, granite countertops, over-sized islands, and high-end cabinetry. They also boast spacious open layouts, large master suites with custom closets, high-end tile and hardwood flooring, versatile loft space on the second level, and private patios with beautiful views of the community lake and the adjacent nature preserve. With a focus on promoting a sustainable, healthier future for people and the environment, Centra was designed using green building standards. Townhomes in Centra are built with energy efficient appliances and air conditioning systems, water saving plumbing fixtures, impact-resistant windows and doors, and low VOC paint allowing for cleaner indoor air quality. The developers of Centra, as well as its environmentally conscious residents, take pride in knowing that Centra is a "Green Community." In addition to being conveniently close to many activities and attractions, Centra is just minutes from I-95 and Florida's Turnpike making it a breeze to take a day trip to one of the nearby South Florida cities such as Miami or West Palm Beach, or to one of the two nearby International airports. Centra is also zoned for some of the area's top-rated public schools, including Calusa Elementary School, Omni Middle School, and Spanish River Community High School. 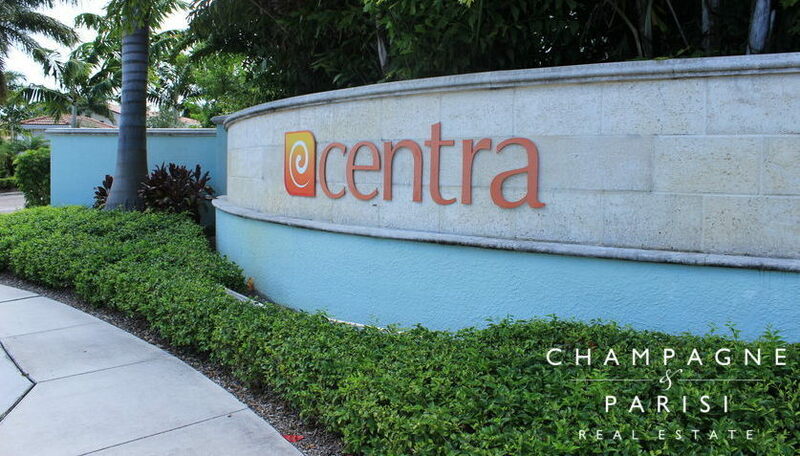 With an exceptional Central Boca location, a host of on-site amenities, and a wide selection of stylish townhomes for sale, Centra provides premier townhome living for those seeking an active lifestyle. If you think Centra sounds like the perfect place to call home, you may also want to browse townhomes for sale in Central Park and Charleston Place, both of which are also highly-desirable townhome communities in Boca Raton. If you would like to learn more about townhomes for sale in Centra, or in other Boca Raton residential communities, please call us today at 561-998-9015. You may also complete the online contact form below and one of our Boca Raton real estate experts will be in touch to assist you. We at Champagne & Parisi Real Estate are committed to providing unparalleled professional service to our clients and would be delighted to assist you with any and all of your South Florida Real Estate needs! Also, please consider registering for a free account which will enable you to receive automatic email notifications when new townhomes in Centra come on the market in Boca Raton, FL.